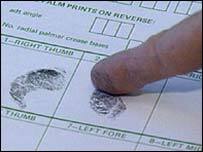 A Brazilian judge has announced that US citizens will be fingerprinted and photographed on entering the country. Judge Julier Sebastiao da Silva was reacting to US plans to do the same to Brazilians entering the United States. He made the order after a Brazilian government office filed a complaint in a federal court over the new US immigration measures. From 5 January, travellers from all countries which need a visa to enter the US will undergo the same checks. "I consider the act absolutely brutal, threatening human rights, violating human dignity, xenophobic and worthy of the worst horrors committed by the Nazis," Federal Judge Julier Sebastiao da Silva said in the court order. The new security measures will come into effect on 1 January unless Mr Da Silva's ruling is challenged by the justice system. Washington's new rules are part of increased anti-terrorism measures. They aim to identify people who have violated immigration controls, have a criminal record or belong to groups that Washington has on its list of "terrorist" organisations. An official from the US Department of Homeland Security said at least two of the 19 hijackers in the 11 September 2001 attacks could have been stopped if this security system had been in place. It will not apply to citizens of 27 nations who do not require a visa to enter the US.